Can You Find the Real Miracle? In the Gospel of John, chapter 9 verses 1 through 12 we find a familiar story about a miracle. The crowd points out a man, blind from birth and Jesus spits on the ground, makes some mud with His saliva, and puts it on the man’s eyes. “Go,” Jesus tells him, “wash in the Pool of Siloam”. So the man went and washed, and came home seeing. Can you find the miracle in this story? Was the miracle found in the power of Jesus’ saliva? While we know that Jesus was human, He was also God and that makes even Jesus’s spit special. 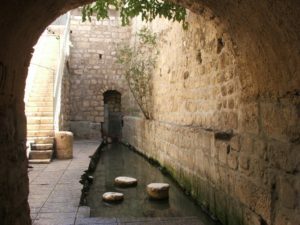 Was it the special waters in the pool of Siloam? During Jesus’s time, the function of the Siloam Pool the pool is fed by waters from the Gihon Spring, located in the Kidron Valley, the naturally flowing spring water would have qualified the pool for use as a mikveh, a bath used for the purpose of immersion in Judaism to achieve ritual purity through bathing. It was also an important source of fresh water for the inhabitants on that part of the city of Jerusalem. It would not be inconceivable to draw the conclusion that the special waters of the pool cleaned the blind man of the source of his infliction. Spit or water, both wonderful thoughts but the real miracle was to see a man who could not see, who did not know Jesus, listen to His instructions and undertake the laborious journey to the pool. The miracle was that the blind man obeyed. The question then to ponder is why? Leading is a gentle process. Would you help someone who is spiritually blind? By the gentleness of your touch, do others know you as a disciple of Christ? Do you know Jesus well enough to recognize His voice? Do you know the “blind people” in your life? Can you accept that God loves you and has set you apart? Isaiah the prophet (chapter 42: 6-7) gives the people of Israel this message from their God: “I, the Lord, have called you in righteousness; I will take hold of your hand. I will keep you and will make you to be a covenant for the people and a light for the Gentiles, to open eyes that are blind, to free captives from prison and to release from the dungeon those who sit in darkness.” Look carefully at these words, “will make you be a covenant.” God gives His people their marching orders, show others the way to God, even if they live in darkness. So for our blind man to understand Jesus, to listen to Him, to obey His command, the blind man had to have been held by probably many hands through his life and helped by generous, god-fearing people. The blind man knew God well enough through those who held his hand that when Jesus spoke, the man listened and obeyed. There are many people in our world today who are blind to the salvation that Jesus offers. Our role, as called out by Isaiah so many centuries ago, is to take hold of their hands literally and figuratively, and lead them by our example. Yes, that is how the miracle of faith works. Show them, tell them, help them, forgive them, love them and even the blind will recognize Jesus’ voice. Your tip, therefore, is to hold out a welcome hand to all who seem lost, and by your example, show them the joy that can come from following Christ.